Indulge yourself with our intensively moisturising Body Butter, made with Fairtrade Shea Butter and Cane Sugar, which are known for their deep moisturising and hydrating qualities. This luxurious butter leaves your skin feeling irresistibly soft, smooth and nourished. Apply generously and massage into the skin as often as required. Why not indulge yourself by following our fair naturally pampering regime; cleanse skin with fair naturally bath cream, exfoliate with our nourishing body scrub and finish with a fair naturally indulgent moisturising body butter. 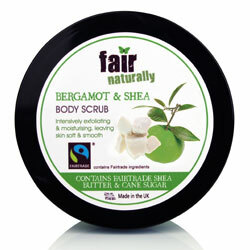 Our indulgent Bergamot & Shea Body Scrub deeply exfoliates the skin. 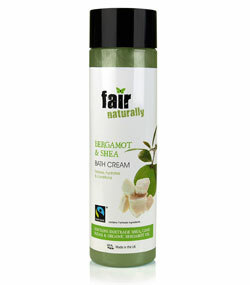 Naturally occurring glycerin from our Fairtrade Cane Sugar helps to maintain healthy skin whilst our Fairtrade Shea Butter keeps it feeling smooth and more supple. This luxurious scrub leaves your skin feeling irresistibly soft, smooth and nourished. Gently massage into damp skin, rinse then towel dry. Relax and unwind with our indulgent Bergamot & Shea Butter Bath Cream, made with Fairtrade Shea Butter, Cane Suga and Organic Bergamot Oil, which are known for their calming, balancing and moisturising properties. This luxurious bath cream leaves your skin feeling irresistibly soft, smooth and nourished. 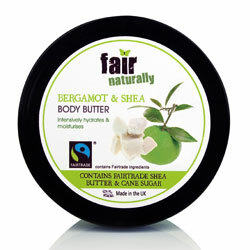 Pour into warm running water to create bubbles and release the aroma of Bergamot & Shea.